Still, in the beginning at least, I thought he was safe there. But he wasn’t, and the treatment this time in G5 is a lot worse than it was before. Either that or he just didn’t tell me everything so I wouldn’t worry. This is torture. This violent abuse. You get treated in ways no human being should ever treat another human being. When your captors get away with grinding your face into the floor, jamming you headfirst into a wall and split your head open, jump on you and beat you while your hands are cuffed behind your back, you know you have no place where it is safe. 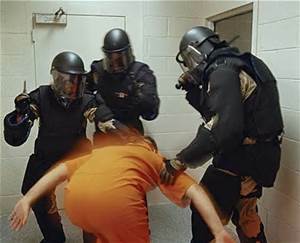 These are prison guard brutality is real yet there is no punishment. Why this kind of behavior is not only allowed, but also condoned, makes me very angry. It makes me feel helpless because I know there is nothing I can do to help him. Why is this allowed!? Some of the guards exhibit worse, insanely criminal minds than many of the inmates, yet they are allowed to leave the building at the end of their shifts and go home. To their wives? To their girlfriends? Do they tell them the brutal things they did to other human beings while they work? Can they go home and say, “Hi, honey I’m home”, and then go outside and play with their kids? Or are their own heads so screwed up by the violence they perpetrate that they instead end up in a bar trying to drink their memories away? Because I know, from some of things I’ve read, only someone who is psychotic would enjoy the things they do to inmates, when the inmates can’t do anything about it.They say they are breaking prison rules. They will get ganged up on by five guys at a time, in armor, who’s sole purpose is to spray them with gas, rip them apart and make sure they are way beyond hurt. Prison politics have their own set of rules that have nothing to do with what is considered breaking the law in the land of the free. Jamie has worked his way up the levels to reach certain benefits more than once. It never lasts for long. Jamie has a strong sense of what is right and what is wrong. He expects if someone makes him a promise to do something they should be accountable to that promise. When that doesn’t happen he gets angry and lets them they are wrong. The more he insists on trying to right that wrong the harder he gets punished. What does that teach him? How is he to learn to trust someone when they use the words, “I promise” yet that promise means nothing? He is constantly judged to be right or wrong so expects other people to behave accordingly, especially when the words, “I promise” are being used. Even through these situations he is expected to remain calm and not get angry? Because if he does get angry it is the excuse to make him feel more pain and suffering. Next up the ladder is level G4. On this level you get to leave your cell to go to chow and you get a little time in rec to watch TV. It isn’t much, but it is better than having your food put through a slot in the door. You don’t have to eat so many meals of biscuits and peanut butter, or two pancakes and peanut butter. When you can go to chow the food is at least a little better. Not by much, most of it still look like slop, but you can get a hot meal and there is more food. instead of sitting behind glass talking on a phone. You can also get a job, perhaps in the laundry or as a janitor to clean the showers. Prison labor is very important to the profit margin of the corporations that own the prison. There is no pay in Texas, but at least you get out of your cell and do something productive, something physical that makes you tired enough to go to sleep at night. Jamie has only made it to G2 once in the years we’ve been writing, and that lasted only a few weeks. He could call me for twenty very short minutes. I was the only person to register my phone. Being able to make phone calls in prison is their lifeline. Taking that away breaks their ties with their family and they may not get that back. No one else. No family. I honestly don’t understand how family can just pretend you don’t exist, but it seems to happen frequently to inmates. Out of sight, out of mind. I think they will throw him a party when he gets out and then go back to their separate corners and let him figure out what to do next with no help from them. There is no help now so why would that change later? It doesn’t take much to get knocked back down to G5 again, A guard can file a case on you for anything they want, real or imagined. Another guard will always verify it is true. It snowballs from there. Inmates aren’t always allowed in the prison courtroom (UCC) when their fate is decided. The guard who filed the case doesn’t even have to be there. Another guard can stand in for him and swear it is true. Guards are always right and inmates are always wrong. It doesn’t matter what the issue is. When Jamie reached G2 he applied to take a course to study for his GED and also to learn a trade. He wasn’t at that level long enough for it to take place. He has been in prison for nearly ten years and he has never been at a level to complete one program that would show the parole board in October of 2016, they should let him out. Without that they will most likely turn him down because without even a GED, and with at least that he has no chance of getting any kind of job anywhere. I understand that, but if they don’t allow him take any classes doesn’t that seem pretty deliberate? He’s not a hardened criminal. He wasn’t a gang member. He had no other convictions on his record. He was guilty of being black more than anything – and not being able to afford a real attorney. Is he guiltless? No. Does he deserve what they have done to him? Again, no. Alright, finally after a few weeks, I had time to read and respond. I read this in it’s entirety, both parts, for the record. And I have to ask; if all this is true and accurate, (assuming it is) where is the oversight, exactly? Even in Texas there are prison oversight committees and the like, so where are they in this case? I promise you all of this is true. Oversight? There is none. I posted part 3 last night. I included quite a few links. The US lost much of any control when they signed over the prisons to the prison industrial complex. You could do a search on that term by itself and learn a lot of the answers to your questions.